Buy the The Grace of Yes Book Bundle here! The WINE Advent Fun is as easy as 1 – 2 – 3 … 4! The book club will cover one chapter a week for 6 weeks beginning Wednesday, January 16th. Preceding each week, a Grace of Yes Reflection, which corresponds to the reading in that week’s chapter, will be posted on the The Grace of Yes blog. You can opt to have it emailed directly to you as well. Don’t miss these or any other special Advent Book Club notices. Sign up here —> WINE Emails. Why order through the online WINE shop? Simple. Your purchase through the WINE shop supports all the wonderful work of WINE ministries, a nonprofit ministry for women. It is also the only place to purchase the Gaze Upon Jesus Companion Journal and Study Guide – filled with insightful reflections, includes the small group questions, a special guide for visio divina, and of course, coloring pages from Brightly Hude Studio. WINE: Women In the New Evangelization offers The Grace of Yes. Generous living isn’t just about putting money in the collection basket during Mass or always being the one who steps up to help out. According to bestselling Catholic author, speaker, blogger, and creator of CatholicMom.com Lisa M. Hendey, generous living is about consistently answering God’s call to act through mission and loving service to others. 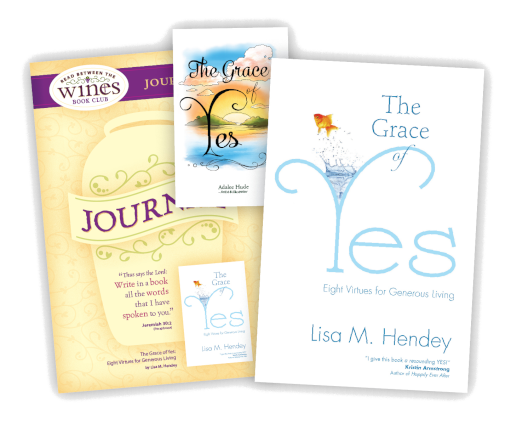 In The Grace of Yes, Hendey shares eight spiritual virtues that have allowed her—and will help you—live generously and joyously say yes to God. With warmth and practical advice, Hendey helps you become more open to God’s unique plan for your life through the virtues of belief, generativity, creativity, integrity, humility, vulnerability, saying no, and starting over. As she candidly reflects on her own faith journey, Hendey guides you toward your own path of generous giving. Each chapter includes questions for personal reflection and a prayer that invites you into a deeper relationship with God. The Grace of Yes was given a 2015 Excellence in Publishing Award by the Association for Catholic Publishers. Sales of Hendey’s four books with Ave Maria Press total more than 55,000 copies. Hendey reaches more than four million people in the United States and abroad each year with her extensive speaking schedule and through CatholicMom.com. Hendey is a regular contributor on national media including EWTN radio, The Catholic Channel on Sirius/XM Radio, and Ave Maria Radio. She has appeared on EWTN Television and CatholicTV. Sign up for the WINE BOOK CLUB EMAILS (no spam, we promise). WINE brings women together from across the world to share their faith through the many WINE book offerings. There are many ways to participate including discussions on our blog or the WINE Book Clubs Facebook group. WINE Virtual Vineyard brings together women, just like you, reading either The Grace of Yes or one of the many Read Between the WINES books and companion journals/study guides available through WINE. Whether you participate in the virtual community to enhance your small group reading or because you need a faith sharing group, the WINE Virtual Vineyard is the place to be. Aside from the CatholicVineyard.com posts and discussions, you can join us on Facebook. Like our WINE Facebook Page; and then become a part of the WINE Book Clubs private group. Be sure to invite your friends! Visit our website or send us an email.